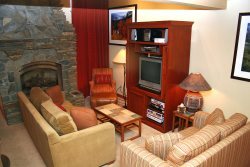 Nice One Bedroom & One Bath Condominium located in the Scenic Meadow Area of Mammoth Lakes. Sleeps up to 5 (approx. 800 Sq. Ft.). This spacious ground floor unit is all one level and there are a few outside stairs to enter the unit. Corner unit is bright with lots of windows to let the light in and has a good view. The Master Bedroom has 1 King Bed (new mattress October 2016), the Living Room has 1 Queen Sofa Bed and 1 Twin Bed. There are 2 TV`s (Living Room is a large flat screen & Bedroom has a flat screen) as well as VCR, DVD, Stereo/CD players in the unit. Phone in unit 760-934-1430. Wifi Internet Access in the unit. Pet Friendly. There is one outside parking space available. Sunrise Condominiums offer a Spa, Seasonal Swimming Pool and Sauna. Coin-operated laundry facilities located in the common area near the office. TOT LICENSE 807-SR46. Definitely one of the easiest and pain free rental experiences Ive ever had. Check in was super easy just go to the office and pickup the keys and drop them off in the same place for check out. Very stylish retro space but still up to todays standards. great big living room and comfortable beds. super close to everything you need to be yet very quiet and respectful. As always we had a fabulous stay. Loving staying at Sunrise with a beautiful of the Sherwins. Mike is a great onsite manager! Friendly, responsive to needs. Love Sunrise and Central reservations!